New England has lobster. Baltimore has blue crab smothered in Old Bay. The Olympic Peninsula has Dungeness Crab. Lobster is lovely and blue crab delicious, but there’s nothing like Dungeness Crab. Celebrate this delectable crustacean during the 2011 Dungeness Crab and Seafood Festival in Port Angeles, WA, October 8 and 9. 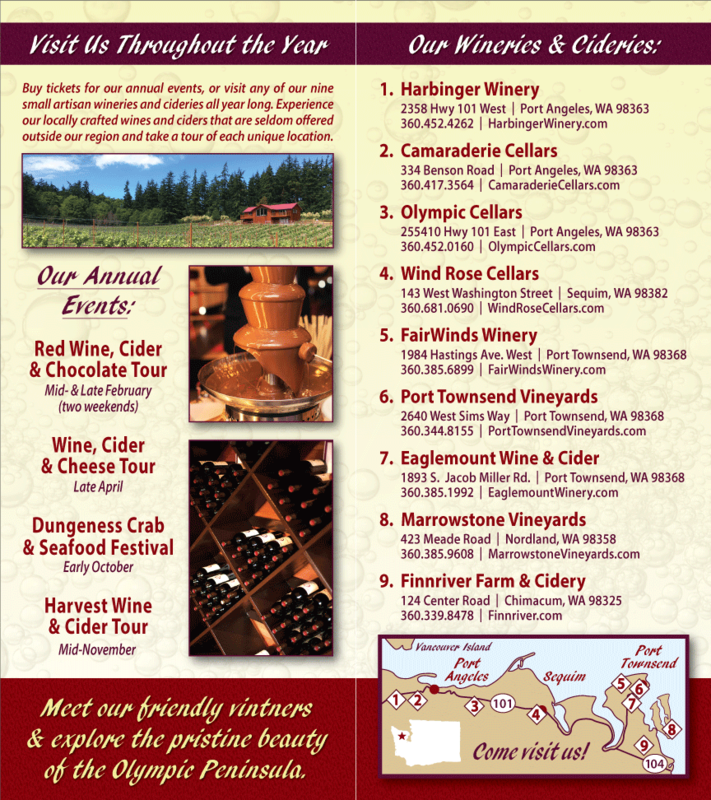 Eat crab and drink Washington Wines made on the Olympic Peninsula at the Dungeness Crab Festival, October 8-9, 2011. Olympic Peninsula Wineries will be there, pouring selected Washington Wines at the Wine and Beer Garden at Crab Central. Drop by anytime between 11 a.m. and 5 p.m. to sample our wines. Feel free to ask the pourers which wines they think go best with Dungeness Crab. You may be surprised by how many options there are. The Galloping Gourmet (aka Graham Kerr) demonstrate how to make his famous crab cakes. Chef Les Chan from Victoria, B.C. prepare Imperial Crab Spring Rolls. Chef Jon Unruh of Wildfire Grill in Port Angeles prepare Dungeness Mac & Cheese – the ultimate comfort food. Chef Kaleb Walace of Michael’s Seafood and Steak Restaurant in Port Angeles prepare Fresh Pasta with Chanterelle Mushrooms and Dungeness Crab with Olympic Cellars Chardonnay Butter. Chef Arran Stark from Cultivated Palette Catering and Brassica Restaurant in Port Townsend show people just what can be done with Salmon. Chef Gabriel Schuenemann of the Alder Wood Bistro in Sequim prepare Scallop Ceviche with pickled Chanterelle Mushrooms. Chef Ron Anderson of Etta’s Seafood in Seattle prepare Cider steamed Blueshell Mussels and smoked hamhock. Even more chefs will demonstrate how to prepare even more dishes. For a complete list of the Dungeness Crab and Seafood Festival Chef Demonstrations, please see Crab Fest. You’ll come away from the 2011 Dungeness Crab and Seafood Festival well fed and armed with new recipes and Washington Wines to enhance them. Now that’s a weekend well spent. Please see Dungeness Crab Festival for additional information.